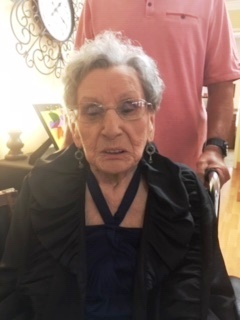 Mrs. Helen Irene Kanar, 97, peacefully passed away on Saturday, November 17, 2018. She was a resident at Cambridge Hills Assisted Living, formerly of Nooe Street, in Pittsboro, North Carolina. She is survived by her daughter and son-in-law, Cheryl and Larry Diegel; granddaughter, Heather Diegel Augustus; five great-grandchildren, Aaron Joseph Augustus, Nathan Daniel Augustus, Ian Matthew Augustus, Owen Alexander Touch and Sophia Marie Touch; sisters, Marnie Rudziensky and Angela Bruce of Lincoln Park, Michigan; and brother, Joseph Kurpiel of Crescent, Pennsylvania. She is preceded in death by her husband, Joseph Nicholas Kanar, her older sisters Hedwig (Hazel) Kurzantkowski and Julia Keplinger. Helen, one of five girls and one boy, was born Helen Irene Kurpiel to Roman and Frances Kurpiel in Uniontown, Pennsylvania. Helen and Joseph were married on June 1, 1942 and lived a happy, comfortable live that would take them to Texas and Mississippi while Joseph served in the army during WWII. They later settled in Lincoln Park, Michigan where they raised their only child, Cheryl. They retired near Cadillac, Michigan in the idyllic, wooded setting of their dreams. Helen was a wonderful cook and baker. Her cakes are still remembered fondly by many. Following the death of her husband, Helen moved to Pittsboro to be nearer her family. She was a friendly, easy-going person, who remained content with life into her last years. A private memorial service will be held at a future date. Donations in Helen’s honor may be made to: Chatham Out-Reach Alliance Food Pantry (CORA), 40 Camp Dr., Pittsboro, NC 27312.